The southwest region of England is picture-perfect, conforming to the stereotype many have of the English countryside with its rolling green hills, wild moors, quaint historic towns and rugged coastlines. It is no wonder that Romantic poets such as William Wordsworth and Samuel Taylor Coleridge drew inspiration from the area. Devon and Cornwall, on the tip of Southwest England, boast some of the most spectacular and unspoilt scenery in the country. The south coast of Devon is known as the English Riviera, and in its major town, Plymouth, the famous naval docks are still home to the Royal Navy. It was here in 1588 that Sir Francis Drake finished his game of bowls before setting off to defeat the Spanish Armada. A few years later, in 1620, the Mayflower embarked from Plymouth to the New World carrying the original pilgrim settlers. On the border with Cornwall, visitors will discover the rugged wilderness of Dartmoor National Park, where wild ponies and hikers roam freely across a dramatic landscape dotted with 'tors' and prehistoric remains. 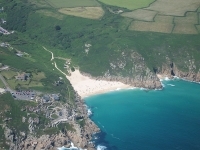 England's most south westerly county, Cornwall is a popular destination for British tourists drawn by the beautiful countryside and a craggy coastline pitted with small fishing villages and glorious white sandy beaches. Southwest England is filled with fascinating sights and sounds, from small towns to vibrant cities, and from stately cathedrals to Neolithic sites, all set in the lush English countryside. The region is a must on any trip to the UK and visitors will not be disappointed.